Kinsley came to me a few years back and suggested that we start a podcast. I really didn’t get it. What went through my mind at the time was that Kinsley was trying to recapture some of the magic from his old radio days as a talk show host and he wanted to drag me into a project that would most certainly end as an embarrassing failure! Who in the hell was going to listen to a couple of guys talking about mattresses after all? Boy was I wrong. 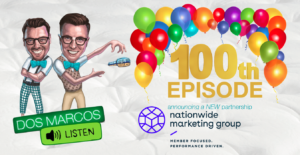 The Dos Marcos podcast ended up as the most popular content on Sleep-Geek.com and we just recorded our 100th episode! Since we started recording Dos Marcos, I have become a big fan of the podcast. I listen to them as I walk my dogs, when I workout, when driving, and even when tracking through airports. I listen to learn, to be entertained, for spiritual growth, and to be motivated. My guess is that this is true for most people that listen to podcasts which according to THIS article by the BBC, includes over 33% of the U.S. population. There are over 600,000 shows out there already, so why did we decide to add to the list? Kinsley explains it best when he says “Dos Marcos is like a campfire that people gather around to take in information about an industry that they love.” I think he’s right. Our goal is to shine a light on people getting it right, point out when we think they are getting it wrong, and have some fun along the way. There are so many companies doing cool things in this business and we want to make sure that people have a place to come and hear about them, learn from them, borrow from them and grow. We are story-tellers in search of the next great story; maybe it’s yours? Now we have a new headline sponsor in the Nationwide Marketing Group. It all started with Jerry Honea, their Senior Vice President who Kinsley and I have come to know and admire over the years for what he has done to help his retailer members grow. Then we met Mike Whitaker from Nationwide, a true rock star in the industry, that also has a burning passion to serve people and drive the retail business forward. When Jerry asked Mike to evaluate our show, Mike totally got it and blew us away with his enthusiasm for the project. I seriously cannot believe what a great collaboration this has turned out to be so far. I just want to say thank you to Kinsley for his friendship and making this show so much fun to do. You have a great brain for this business, I learn from you all the time, and your heart for people is pretty dang awesome. But most of all a big thanks to everyone that listens to the show. We appreciate your support and feedback because it really is the fuel for this campfire. Take a listen to this, our 100th episode, meet Mike Whitaker if you don’t know him already, and get ready for the next 100 shows. We are just getting started!